Vikarabad District with Mandals in Telangana State, Vikarabad District, Vikarabad District with Mandals, Vikarabad District in Telangana State: Vikarabad District is a district in Telangana state in India. Before it was a part of Ranga Reddy district and then came into existence later. The district is bounded by Sangareddy, Rangareddy, Mahabubnager and the state of Karnataka. 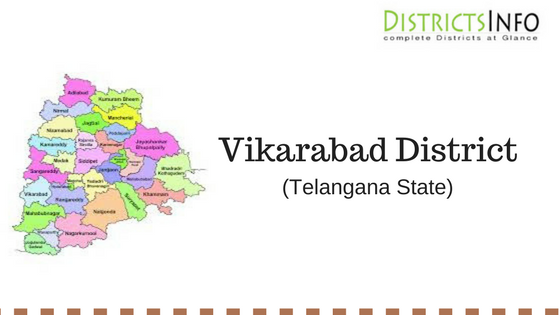 Vikarabad District has 2 revenue divisions and 18 mandals. Ananthagiri Hills is one of the beautiful location and also the heart of Vikarabad District. From here only river Musi get originated and flow through the city of Hyderabad. With many old and beautiful temples, this district has got some beautiful locations for tourists and other peoples to visit. As of 2011 census, Vikarabad District was having a population of 927140. The district has an area of 3386.00 square kilometers. The literacy rate of the district is 64%. The transportation system is good here. Vikarabad District is well connected by roadways and railways. As you get the comfort you can take any ride. Tandur which is one of the cities in this district is the industrial hub of the district. The major product produced from here is blue and yellow limestone. It is also famous for Red Gram production. There are many mines nearby which give employment to many people in this district. The education system is also good with some good schools and colleges.